The original Salem Church was founded in a Brush Arbor with a Sawdust Floor in late 1865. The original pastor was Rev. 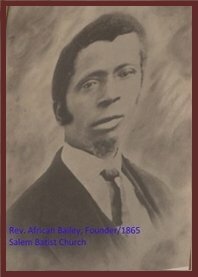 Africa Bailey, a Sergeant in the Union Army during the Civil War. By 1867, Salem’s congregation had grown to 242 members and they were worshiping in a solid frame building at the corner of Carolina Street and Tennessee. Gilfield Baptist Church was split from Salem Baptist in 1883, when it was organized by Dr. J. Jay, and moved to 32 West Virginia Avenue. A brick Church was constructed under the pastorate of Rev. J. W. Ribbons and the indebtedness was liquidated under the pastorate of Rev. R. E. Harshaw. Other pastors of Salem included Reverends C. H. Hayes, Heard, J. M Booker, Echols, Williams Winston, and R. B. Roberts. Under Rev. Robert’s leadership, Salem Baptist moved to what is now Crump Blvd (then Iowa) and Florida in 1927 and built a two story beautiful structure, but the upper floor was not completed at this time. Rev. W. L. Varnado became pastor after the death of Rev. Roberts in 1936. Rev. A. L. McCargo, Became pastor of the Old Gilfield Baptist church in 1934 and in 1940 he merged the congregations of these two churches into one that became known as Salem Gilfield Baptist Church. Under Rev. McCargo’s leadership, the upper structure of the church was completed and the entire debt on the Church paid off. He served as pastor until 1970 and was Pastor Emeritus at his death in June, 1975. Rev. L. A. Wakefield came to Salem Gilfield as Rev. McCargo’s assistant in 1966. He was elected pastor May 30, 1971. In January, he initiated a building fund as a means of satisfying members desire for a new Church. With Rev. Wakefield’s divinely inspired leadership and a membership effort directed by God’s Holy Spirit, services were held in a new edifice at 3176 Kimball Avenue, January18, 1976. Rev. Wakefield’s pastorate ended in December, 1980. Rev. Charles H. Ryans, Sr., was elected pastor of Salem Gilfield, April 21, 1981. He was formally installed June 14, 1981 with many of Memphis’ most outstanding Baptist Ministers participating. Rev. Ryans’ tenure was truly a pastorate of service. His sermons were straight from God’s word without external frills. Within the first few weeks after his election, he had visited every member on the sick list and all the aged members who were confined. He established the Worker’s Council to provide a Bible study class for all teachers and officials of the Sunday School, the Baptist Training Union and other auxiliaries of the Church, and a training Class for Young Associate Deacons which teaches the great responsibilities of Deaconship before they are installed and confirmed. He established a “Tape Ministry” for the sick and shut-in, and aged members of the Church, so they can hear the Sermons, music, and all other phases of the worship services. Rev. Charles H. Ryans’ preaching brought the membership together and because he was preaching only ” What thus saith The Lord.” Salem Gilfield’s members were more worshipful, more dedicated and more committed to the cause of Christ. On August 31. 1986, the debt on the property at 3176 Kimball was retired, a glorious “Praise to Gods Service” was held during the Mortgage Burning Ceremony. Rev. Charles H. Ryans. Sr., retired as the pastor of Salem Gilfield on December 31, 1996. Rev. Angelo McBride was elected pastor of Salem Gilfield on March 9, 1997. He began his pastorate by becoming a part of, and heartily supporting, all established ministries and organizations of the church and by making himself available to each member. Rev. McBride served as pastor until October 25, 2010. Rev. Stanford L. Hunt came to serve as worship leader on February 13, 2011. He was elected pastor of Salem Gilfield on Saturday, February 25, 2012. He preached his first pastoral sermon on February 26, 2012. His installation services were held on May 6 2012.